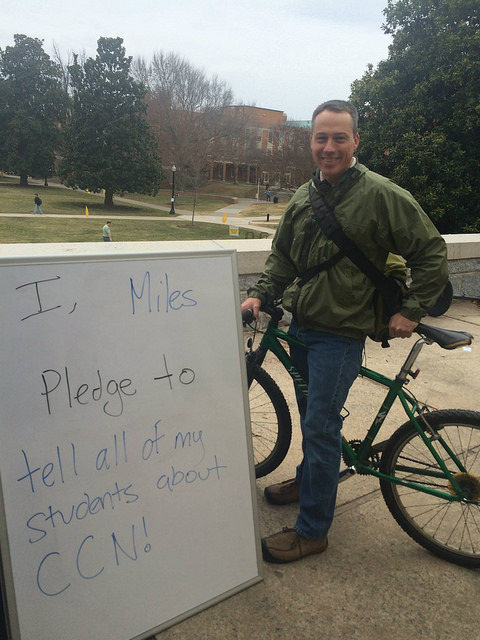 Biology professor Miles Silman makes his conservation pledge. Staff and students, under the guidance of staff members Megan Anderson and Hannah Slodounik, and student interns, Kristen Cortese and Jack Sypek, took the lead in raising awareness and sharing information. They held events and used social media to inform students on how energy and water is consumed in the residence halls and ways to reduce consumption, including using daylight when available, changing the thermostat settings and taking shorter showers. 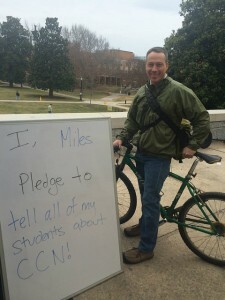 View a Flickr gallery of Wake Forest participants pledging their support.